Condition your wood and bamboo kitchenware with this food-safe and non-toxic protective finish. Can also be used to condition children's wood toys. By applying this product regularly on your wood kitchenware, it will prevent the absorption of liquids that can cause stains, water damage and wood cracking, and help repel odours from foods. Ideal for wood and bamboo cutting boards, butcher blocks, countertops, wood utensils and wood baby toys. Prior to use, it’s a good idea to disinfect and deodorize your pieces by applying diluted vinegar solution and rub with a cut lemon. Let sit for 10 minutes then rinse. Once completely dry, apply a thin layer of the Butcher Block Conditioner to the surface of your wood and bamboo kitchenware using a clean non-abrasive cloth. Let sit for 20-30 minutes then gently wipe off excess. Please note, very dry pieces may require up to 2-3 coats as wood will absorb some of the finish. Re-season wood at least once per month. We recommend that butcher blocks and cutting boards be conditioned more often as chopping of food cuts into wax finish. To prevent warping, cracking and excessive dryness, never wash wood or bamboo kitchenware in the dishwasher, nor submerge in water for extended periods of time. 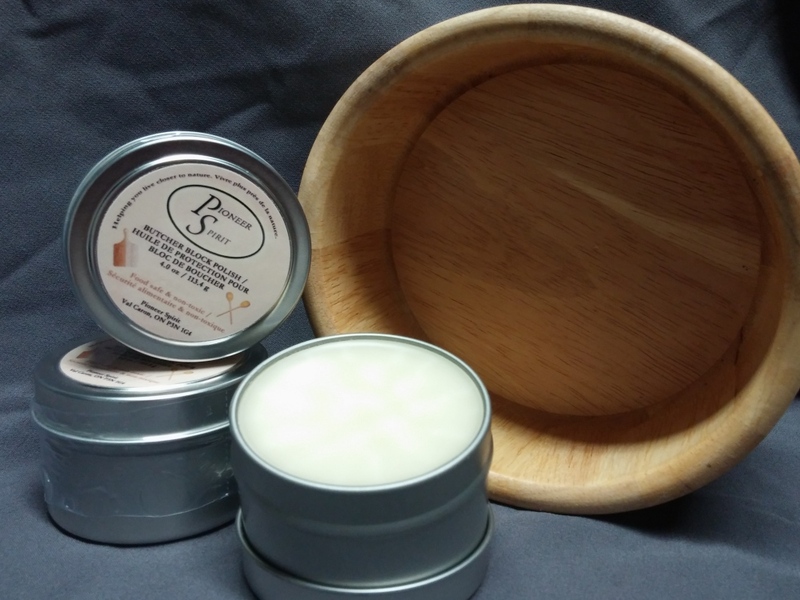 Be sure to disinfect/deodorize your wood and bamboo kitchenware prior to applying our Butcher Block Conditioner. Refer to above. Always wash your pieces with lukewarm water. Hot water will melt away some of the protective finish.